Description: This ward may be Mametz, located on the ground floor adjacent to the old casualty department. The structure in the middle of the ward was known as a 'DONKIN'. Its top was tiled and it was fitted with drawers over cupboards down both sides. 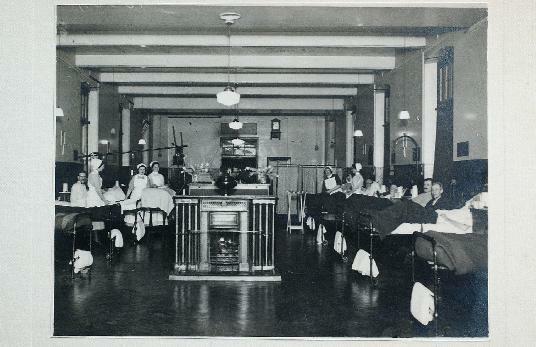 The height was sufficient to prevent bedridden patients from seeing across the ward at other patients. The end of the donkin in the foreground appears to be an open fire and is flanked by radiators. There is a fire guard but no fire tools. There is no chimney. One bed is fitted with an overhead frame for traction.